Hire Inflatable Eliminator Bungee Run Game. Tug of War Bungee Run Inflatable Game. Our Bungee Eliminator Inflatable is a brilliant two player bungee game popular for private parties, corporate fun, and team building events. 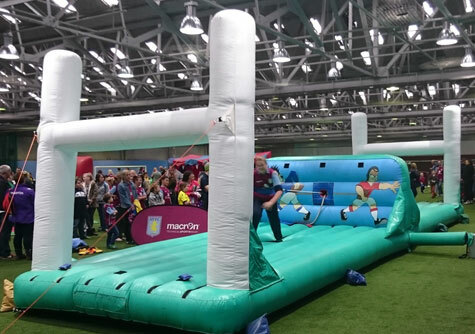 Each player starts from the centre of the inflatable and has to place three coloured batons, one at a time, on the corresponding coloured pillar at the end of the inflatable bungee run. This may sound simple but at the other end of the inflatable is your opponent, attached to the other end of the same bungee rope, who is trying to do exactly the same - and the bungee rope will only stretch so far before one gets bungee'd backwards! The first player to correctly place all three batons is the winner. Tactics and not just strength play a big part in this fun game which can provide hysterical fun for players and a game that always get the spectators cheering. As well as the red and blue version above we also have the rugby themed version of the same game as pictured below. Approx Size 40L x 12W x 10ft High (15ft for rugby version) but needs an overall operating area of 50x20x10ft. If you have any queries, questions, or would like to book our Bungee Eliminator inflatable for your event please call us on the number below or click to enquire and we will do all we can to help. If you have any queries, questions, or would like to hire an inflatable eliminator bungee run please call us on the number below or click to enquire and we will do all we can to help. If you don't have room for the Bungee Eliminator why not have a look at our Bungee Run Inflatable which requires a smaller operating area.